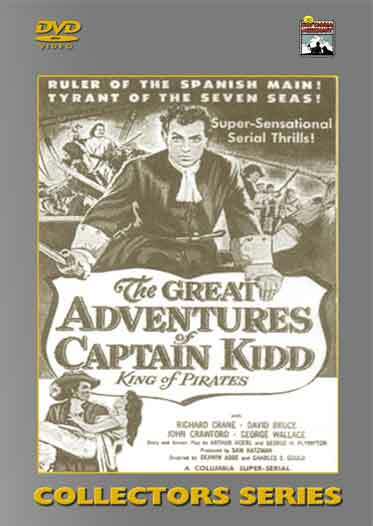 The British Admirality assigns two officers, Richard Dale and Alan Duncan, to gather evidence to convict Captain Kidd of piracy in the English courts. They sail for New York to learn the whereabouts of Kid, and posing as ordinary seamen, they join his crew. They learn that Kidd, the legendary swashbuckler of the seven seas, is not a a villain who scourges and plunders at will, but a man whose loyalty to England knows no bounds. But can they keep him from being betrayed by his enemies and hanged? 15 Chapters – 1953 – 2 DVD Set.